CASology: Week 167: Weekly Winners! 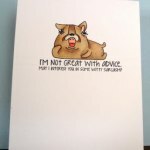 Valerie's use of lots of white space, limited layers and minimal embellishment along with this adorable image add up to card that will encourage a friend who needs to know he or she is not alone! 1. 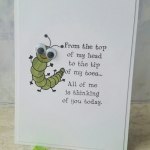 Joyce's Choice: I love Rahmat's adorable hand drawn caterpiller and wonderful sentiment. 2. 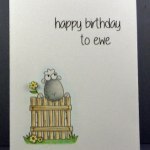 Tracey's Choice: Skye's play on words and fabulous colouring makes for a great birthday card. 3. 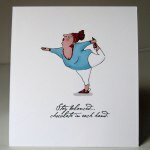 Judy's Choice: Bev's card is silly, clever, and downright funny! CAS at its finest. 4. Jen's Choice: I love Conil's cheeky sentiment and the image she paired with it is perfect! 5. 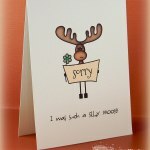 Kymona's Choice: Henriette's moose looks silly on those stick legs. Great coloring! Super CAS! 6. Kimberly's Choice: Ksenija's sweet pink base and tu tu leaping lady is silly to me! Congrats! 7. Hazel's Choice: Loved Loli's classic CAS layout, touch of bling, & hilarious, silly sentiment! 8. 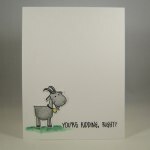 Melissa's Choice: Bobbi's punny card is perfectly CAS with lots of white space & simple dimension! 9. 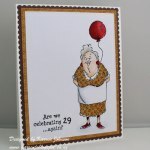 Hannelie's choice : Karren's beautifully colored & pieced gran celebrating her 29th made me chuckle! Be sure to stop back in an hour for challenge #168! Thanks for the honorable mention, Kymona! Appreciate it. Thank you so much for the HR...I'm thrilled. 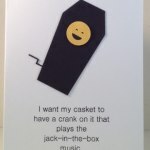 All the other cards were so clever and funny. Thanks for the shout out, Hannelie! Congrats to all the winners - fabulous and fun cards! Thank you so much for the shout out, congrats to Valerie, and other HM's! Thanks for liking my card enough to give it an HM, Melissa, and congrats to all the other HMs and winner.